This dish is basically autumn in a pot. 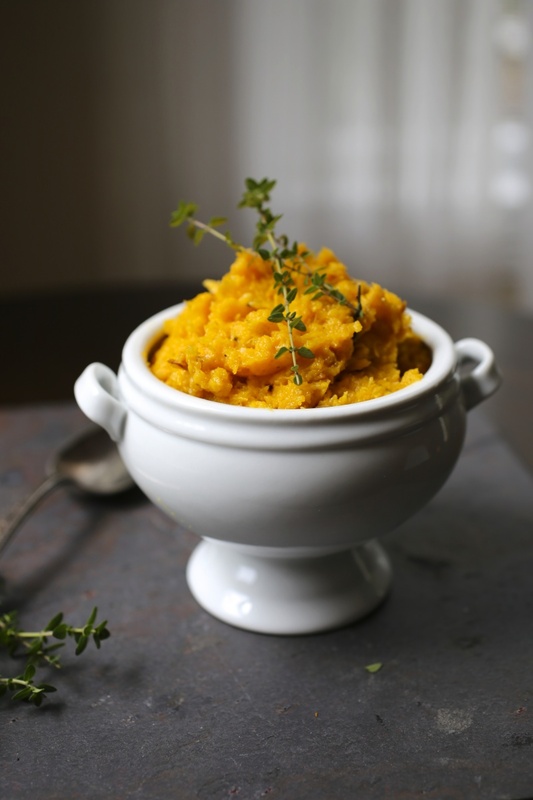 It’s orange, it’s delicious, it’s healthy, and you can serve it for Thanksgiving or as a side for any meal. Now that I live in the boonies and have to drive to the grocery store like a normal, I have a bad habit of buying way too many vegetables at once. I have such optimism in the produce aisle, thinking of all the tasty things I’ll make, but time gets away from me and eventually, with great shame in my heart, I end up with a bin full of bendable carrots and fuzzy broccoli rabe. But I never, ever regret buying too much winter squash (like acorn, delicata, kabocha and butternut). Those things last for-fricking-ever. I mean, I don’t just adore them because of shelf-life. That would be silly. “Hey, you lazy bastards. Wanna make something that won’t rot?” Damn, I should have gone into advertising. I think I have a knack. Anyway, I’ve had this butternut squash sitting on my counter for at least 3 weeks (lie, 5 weeks) and look; still perfect! 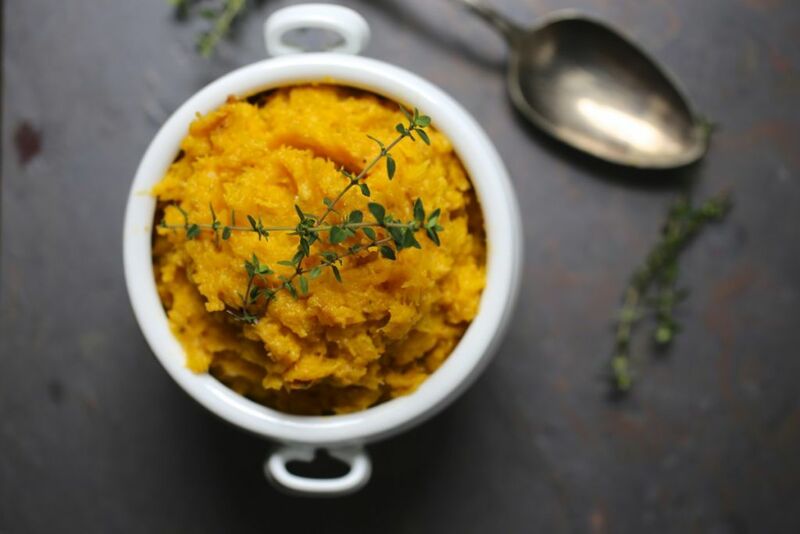 Butternut squash is packed with fiber, vitamins A and C so it’s a great, healthy alternative to mashed potatoes and look at that color. It’s like being punched in the face by fall! We had it with Baked Chicken Thighs with Lemon and Garlic. It’s a great combination. I can’t believe there are actually instructional videos online on how to peel and cut up squash like it’s some difficult ta…you’re looking at it right now, aren’t you? I’m not judging. Really, that’s not my judging face, it’s my regular face. Seriously though, just use a vegetable peeler to get most of the skin off, scoop out the seeds and chop it up. No biggie. Most recipes for mashed butternut squash call for boiling or roasting it whole but I really like the caramelized flavor it gets from roasting the cubed pieces. It also speeds up the cooking time which is always a plus. Toss a few garlic cloves onto the same pan and they’ll turn sweet and nutty in the same time it takes to cook the squash. When buying butternut squash, look for ones with a… sorry, there’s no way to say this without sounding like a perv… look for a long, thick neck and a smaller bulb. Most of the flesh is in the…shaft. Yes, I am twelve. Also, keep it on the counter, not it in the fridge. This would work perfectly as a Thanksgiving side dish. Recipe can be easily doubled but use a 2nd sheet tray if the squash won’t fit in a single layer. You can make this up to 2 days ahead, reheat in the microwave or on the stovetop, on low, stirring often. Add a bit of water or milk if it’s too thick. If you like a bit of sweetness, add 1 tablespoon of maple syrup while mashing. For a vegan version, substitute coconut cream and vegetable stock for the mascarpone and milk. Simple, beautiful and delicious. This butternut squash is roasted with garlic and thyme, then mashed with creamy mascarpone cheese. A perfect side dish. 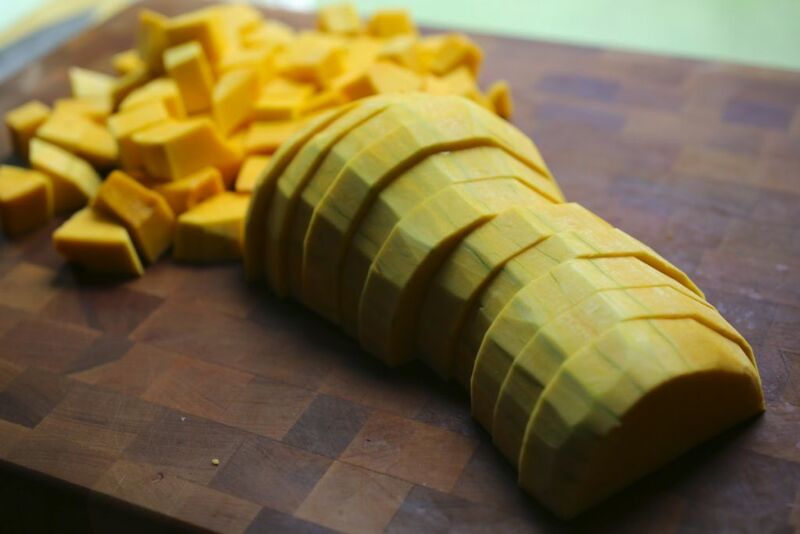 Peel, seed and chop the butternut squash into roughly ¾ inch pieces. Place on a sheet tray with the whole, peeled garlic cloves and toss together with olive oil, salt and pepper. Spread everything out in a single layer. Roast on the middle rack. After 20 minutes, add the thyme and turn squash and garlic so the other side browns. Cook for another 20-25 minutes. 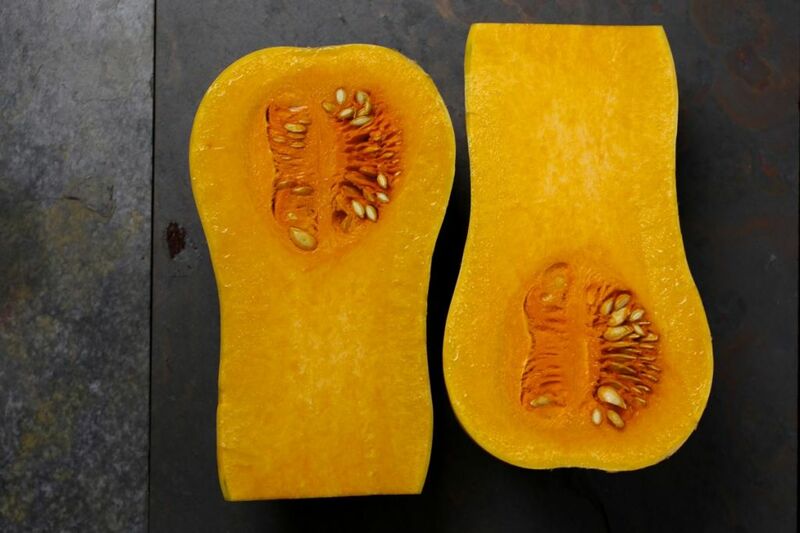 You want the squash to be very tender and just lightly brown. Remove from oven and place squash and garlic in a bowl. Using a potato masher, mash the squash and garlic until it’s all mixed up and you can’t see any more chunks. If you like a very smooth texture, you could pulse it in a food processor instead. I like it more rustic so I just mashed mine in the bowl. While it’s hot, add the mascarpone (or sour cream), butter and 2 tablespoons milk. Stir until smooth and creamy. If it’s still too thick, add more milk a little at a time until you like the consistency. Season with salt and pepper to taste. I like the addition of mascarpone and I have a 2-week-old sitting on my counter (squash, that is). Sounds like a good one! 2 weeks old, practically a baby! If you make it, let us know how it turns out. Here is one of the best squash prep tips ever: From my Auntie Ethel, long gone to her great reward. She grew up back when girls were named Ethel, lived through the depression, taught me to make pies, and was a first rate organic gardener. 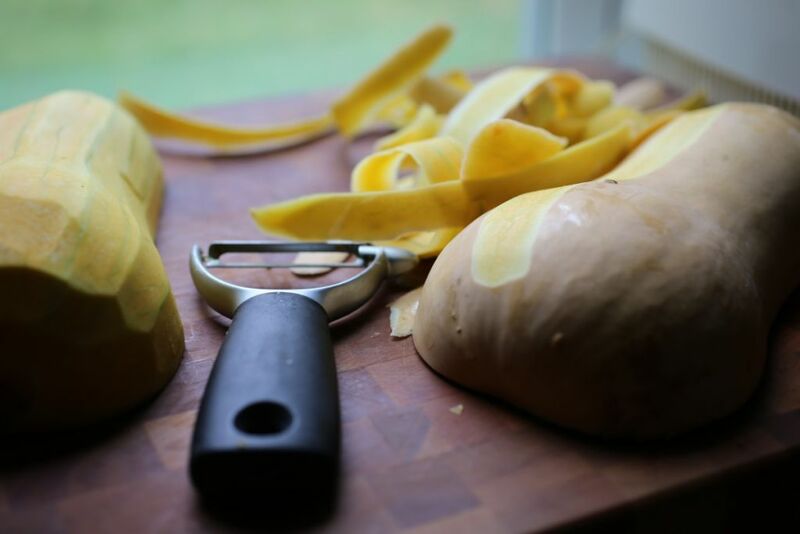 We both grew a lot of butternut squash because it is prolific, keeps all winter, and is so versatile–you just can’t beat that meaty shaft (OK, you’re a bad influence). Anyway, the little tip for getting out the seeds and pulp in a jiffy, nice and clean, is to use a metal canning lid to scrape it out. It’s sharp and round! Also, works great for pumpkin guts!! When the squash are mature (:D they can be hard to get a knife through. I use a heavy chefs knife and whack it (sorry) with a hammer. Looking forward to trying your recipe as I have just harvested my first crop in many years. I also tried growing baby blue hubbard squash for the first time and they are ugly scary gigantic. May have to use a hatchet on them. That is SUCH a great tip! I love it. Especially for pumpkin guts which are all but impossible to get out without swimming in them. Be careful with that hatchet though! Ooohhh, this looks so good. I love butternut, and I’m going to have my BFF and her hubby over for Turkey Day dinner and was looking for a good side. Not only will this be tasty and lovely, but it has as a bonus that I can make it ahead. Cool! Let us know how it turns out. I love dishes that I can do in advance and just warm up on the day. I have a vegetarian boyfriend and i am always looking for new recipes to impress Eric. I often make butternut squash mostly because I love it! I learned to stick the squash in the microwave on 4 minutes and it helps soften it to remove seeds easier and it roasts much faster! What a great idea. I’m definitely going to try it. Thanks! Yeah i one of those stupid people that needed that video on how to handle a butternut squash. I had been whacking into two pieces. And throwing them in the microwave flesh side down. And there are some other tough squashes out there that are hard to handle. Like those big pumking varieties, Mother Hubbard, never tackled it. I knew a person that thought you cook oysters from a can for hours! I had to tell her they are already cooked. And then a person I heard about that thought you could eat oysters raw from a plastic container in the market. I heard they got sick. And we there are those Asian vegtables out there that I don’t have any idea what to do with.